Over two years have passed since the outbreak of the RHI scandal, the resignation of Martin McGuinness and the subsequent collapse of power-sharing at Stormont. In the absence of a functioning Executive, the Department of Agriculture, Environment and Rural Affairs (DAERA) has devised a flowchart to assist civil servants with decision-making. 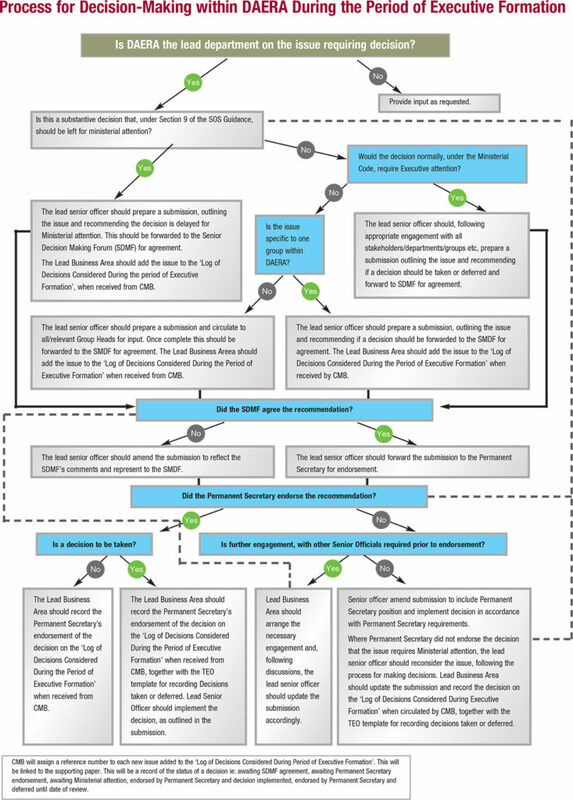 The flowchart, seen on the next page, provides guidance to civil servants around decision-making in the absence of a sitting minister. 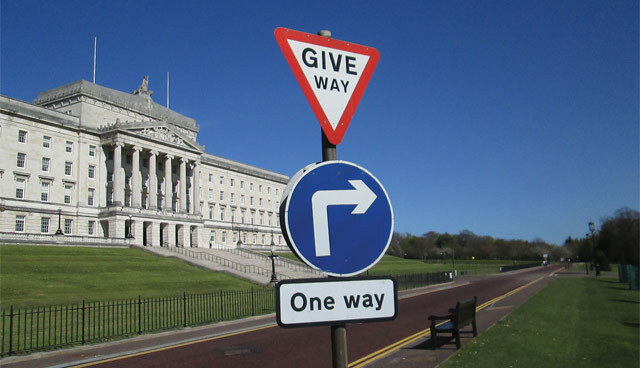 The creation of the flowchart came weeks after the passage of Westminster legislation by Secretary of State Karen Bradley, aimed at giving greater clarity to civil servants who have been overseeing the operation of Northern Ireland’s public services since the collapse of devolution in January 2017. The absence of an Assembly has resulted in considerable uncertainty and confusion as to what decisions can legally be taken without the approval of a sitting minister. Such uncertainty was recently seen in the High Court quashing of a decision by a civil servant to sign off controversial plans for the Arc21 incinerator in north Belfast’s Hightown area. The ruling determined that civil servants did not have the legal power to approve the planning application without ministerial approval. Aptly titled ‘Process for Decision-Making within DAERA During the Period of Executive Formation’, the chart was finalised on 30 November in the weeks following the issuing of guidance on Bradley’s legislation and outlines the steps departmental officials should consider when faced with a “substantive decision that, under Section 9 of the SOS Guidance, should be left for ministerial attention”. Obtained by The Irish News through a Freedom of Information (FOI) request, the diagram illustrates how DAERA officials must consult with the Senior Decision Making Forum (SDMF). It also demonstrates the heightened responsibility of departmental permanent secretaries, with the Lead Business Area and senior officers obliged to record the endorsement of permanent secretaries in a “Log of Decisions Considered During the Period of Executive Formation”. The final stage of decision-making lies with the Permanent Secretary. Central Management Branch (CMB) assign a reference number to each new issue added to the Log of Decisions. This step records the statuses of such decisions, which fall under six categories: awaiting SDMF agreement; awaiting permanent secretary endorsement; awaiting Ministerial attention; endorsed by permanent secretary and decision implemented; and endorsed by permanent secretary and deferred until date of review. Head of the Civil Service David Sterling, whilst welcoming Karen Bradley’s legislation, warned that the impartiality of civil servants must not be compromised. Speaking at a Brexit-themed event in Brussels, Sterling said: “Only ministers can decide what are the best strategies and policies to make a difference, only ministers can set priorities for action, and only ministers can choose how best to allocate the scarce resources, especially financial resources, available to us”.